Between ranching, fishing and hunting, Randy developed an early appreciation for natural resources. His legal career followed the same path, focusing on real estate and natural resource transactions and development. 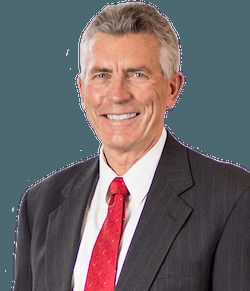 He now advises some of eastern Idaho’s largest irrigation and agriculture and mining enterprises, including Monsanto Company, Hess Pumice Products, Inc, Idaho Ground Water Appropriators, Aberdeen-Springfield Canal Company, Gehring Agri-Business, and Koompin Farms. Randy is lead counsel in the ongoing monumental water disputes between surface and ground water users across southern Idaho, representing several ground water districts made up of businesses, municipalities, and farmers that irrigate nearly a million acres. His results-oriented approach to solving legal problems, and his ability to sort through complex legal issues and focus on the things that matter, has enabled ground water users to avoid curtailment despite multiple threats, ongoing litigation, and the worst drought in recorded Idaho history. Randy also enjoys the personal connections that are built through strategic business and estate planning. Over the years he has organized businesses and prepared estate and succession plans for hundreds of farmers, ranchers, small businessmen and families. He understands that the maxim “an ounce of prevention is worth a pound of cure” is especially germane to these events. Randy is admitted to practice law before all Idaho state and federal courts. He has argued multiple cases before the Idaho Supreme Court, and also appears regularly before the Idaho Public Utilities Commission, Snake River Basin Adjudication Court, and Idaho Department ofWater Resources. Randy is often asked to speak to professional and civic groups on subjects within his expertise. Eastern Snake Plain Water Wars and Their Impact on Idaho Cities, presented to the Association of Idaho Cities Annual Meeting June 21, 2010. The Complexities of State Management of Wildlife Under Federal Environmental Laws, presented to the Conference of Western Attorneys General August 2, 2009. Surface Water Use v. Ground Water Use: The Case in Idaho, presented to Idaho Water Law 2009 Conference May 8, 2009. Randy’s love for hunting and fishing led an appointment on the Idaho Fish & Game Commission where he has served since 2006. He is an avid skier and in 2010 completed forty years of volunteer service on the National Ski Patrol (NSP). His ski patrol career included positions as Director of the NSP Intermountain Division, member of the NSP National Board of Directors and First Assistant National Chairman. He is also an active member of his church, married to a great wife (Becky), and the self-proclaimed favorite grandfather of eleven grandchildren.